The campaign for a general strike and civil disobedience across Egypt to demand the removal of the ruling military council brought tens of thousands of university and school students out in protest on 11 and 12 February. There was intense activity on university campuses around the country as students boycotted classes, held marches and organised their own teach-ins and events. At Cairo University and the American University in Cairo lecturers also joined the strike. Outside the universities, however, few strikes and workers’ protests directly connected to the #Feb11 call have been reported so far. There has been an intense media campaign against the strike call over the past week led by the military council, but with the backing of the mainstream political parties. Helwan University to the south of Cairo saw one of the biggest demonstrations on 12 February with up to 4,000 students marching on a lecture being given by the Minister of Higher Education. Thousands took to the streets in the Delta city of Mansoura, led by women students carrying white shrouds as a sign of their readiness to face death. At Cairo University hundreds of students marched around the campus chanting against military rule on the second day of the strike. 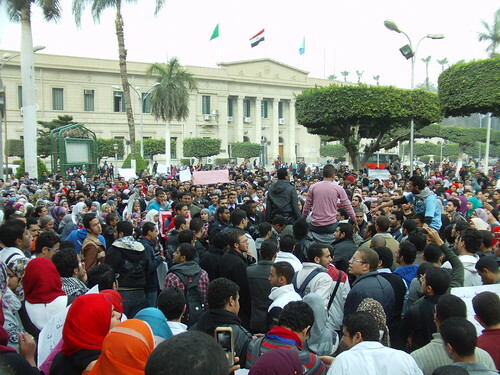 Thousands were also reported to have joined the demonstrations and strike at Alexandria University on 12 February. At Port Said University students brought black flags of mourning for their march, while at other universities funeral prayers were said and protesters carried symbolic coffins in memory of the victims of police and army attacks during the revolution. February 12, 2012 in Education, Egypt.